Well, it happened. 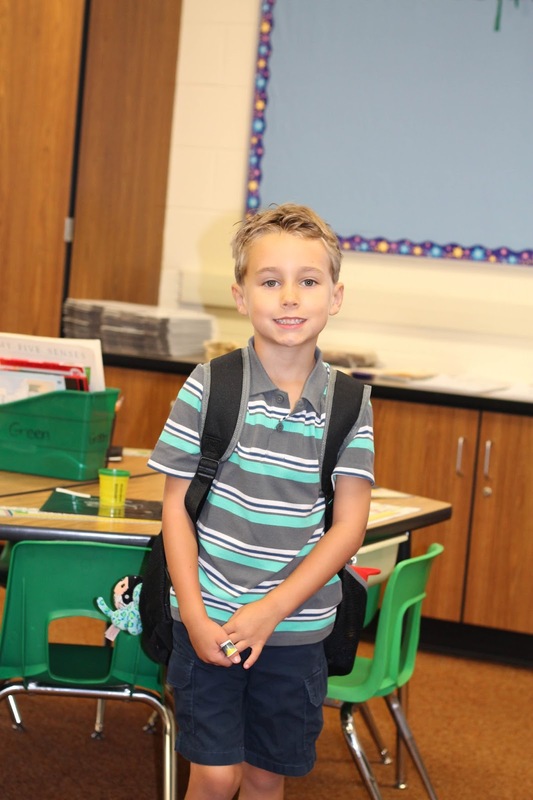 My baby boy started 1st grade yesterday! I literally feel like I blinked and I now have a young man living with us. I get so emotional around this time of year. It's so bittersweet. 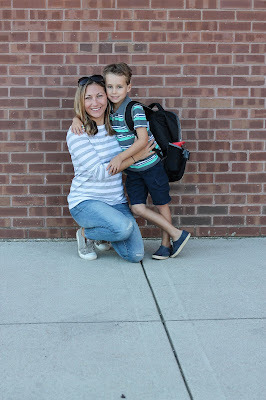 I absolutely love elementary school and what it has done for Brayden, and of course growing up is a part of life, but man does it pull at my Mama heartstrings. I kept thinking back to when he was just a teeny tiny baby (which is kind of hard to remember and that kills me) and how fast the time has gone. I will always want to freeze time but since that can't happen, I embrace these new changes. 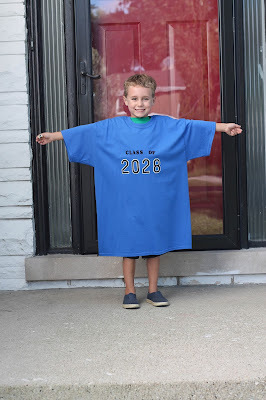 The day before his first day I had Brayden put on this t-shirt I made him last year and snap a picture. 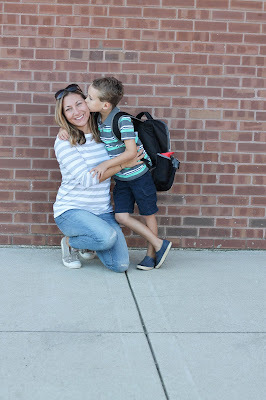 I didn't want to have to do this on the morning of his first day. I know I will love looking back at how he changes over the years. And for fun here's last years vs this year. Look at where the shirt hits his legs! He's grown so much already! At night we read none other than The Night Before 1st Grade and it was a really cute book. His Kindergarten teacher gifted each kid this on the last day of school last year. 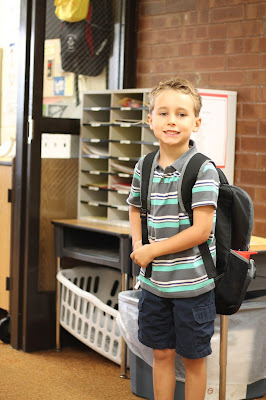 I also bought the night before Kindergarten when he was going into Kinder and that one is adorable as well! Yesterday morning I made chocolate chip/blueberry pancakes at Brayden's request. I did have to go upstairs and wake him but thankfully he didn't give me too hard of a time. What are you most excited about 1st grade? 2. Is there anything you are worried about? 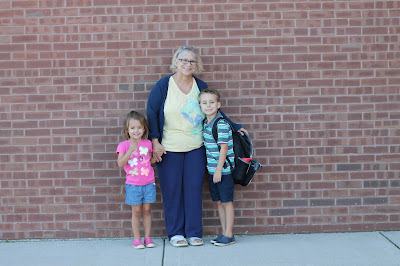 After breakfast we headed out for a few pictures then my Mom came over and we all drove to school. For the first day I like to drive him in the morning but he will take the bus home and here on out. Brayden was so sweet including his sisters and my Mom in all his pictures! I love that he shared his special day with everyone so nicely. Ella even got a goodbye kiss! I gave him the biggest hug and the tears just started falling. He almost cried but he didn't and I was so proud! (now only if I could have held it together, we would have been good!) His teacher is so sweet and gave me a big hug. 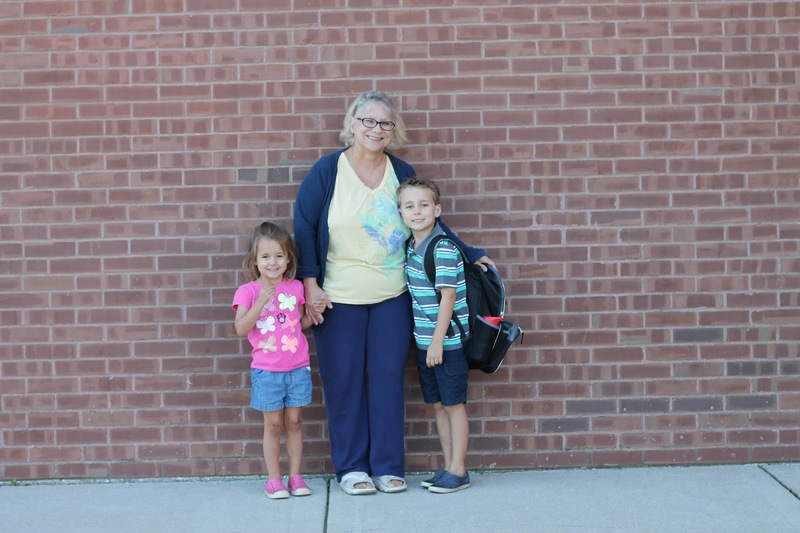 She has 4 grown kids of her own and she said with the first one everything is always so hard, but it gets easier. I know that's true, but I have a feeling I will still be crying like a baby when Ella & Avery hit grade school! The rest of the day was a little weird, it definitely felt different not having Brayden with us, but us girls managed to have a great day! Ella and I made Brayden the monster cookies (which he said are his favorite even though I've never technically made these exact ones) and I enjoyed hearing all about the first day! 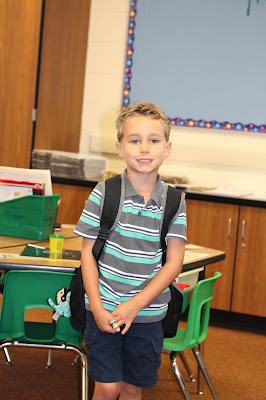 I know 1st grade is going to be amazing for my boy! Steal away! I sure did, LOL! All the emotions over here! Tear-filled eyes for sure. What a cutie oh and the shirt idea...love it! I can't believe how much he's grown in a year....stop it, just stop!! I loooooove the picture of him kissing you. Oh my goodness! Teach me your ways on getting through the first day! Ahhhhh!!! The pictures in the shirt is such a cute idea!!! 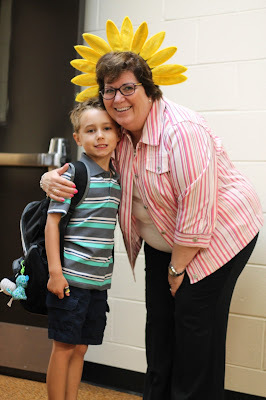 It will be so fun to look at them as he grows! Oh my GOSH, Lizzie, the picture in that shirt is the best idea I've ever seen. I SO wish that we had started doing this. 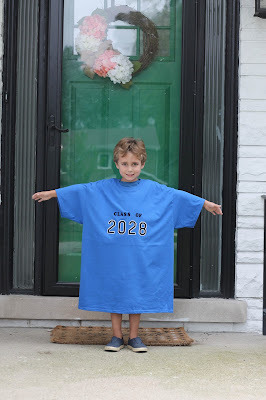 I'm seriously about to google C/O 2029 t-shirts and order one now so I can snap a pic of Jacob before we get too far into the school year. What a great idea! I'm sure he's going to do just great in 1st grade! Such a big boy! 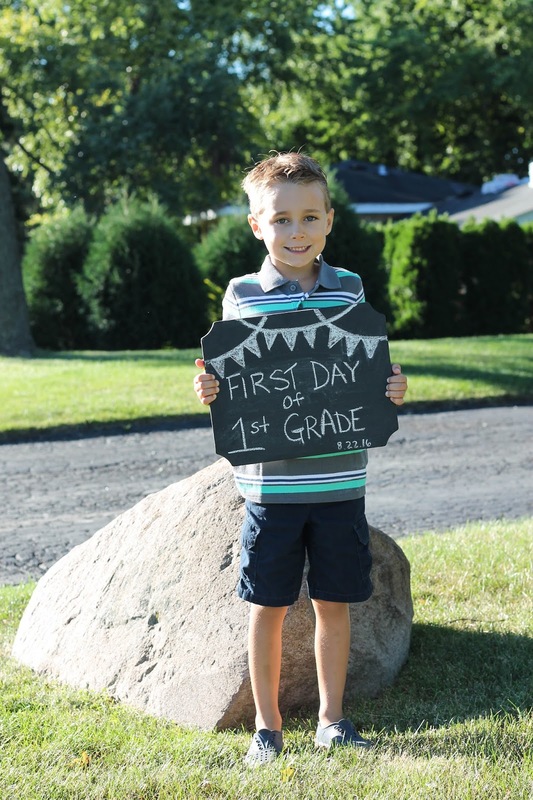 I love that picture of him in the class of 2028. So cool. I can't believe he is in 1st grade. 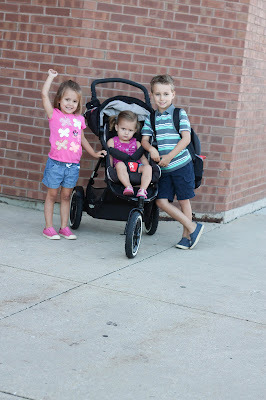 Love your first day photos!!! Oh man, it makes me a little emotional just reading this!! 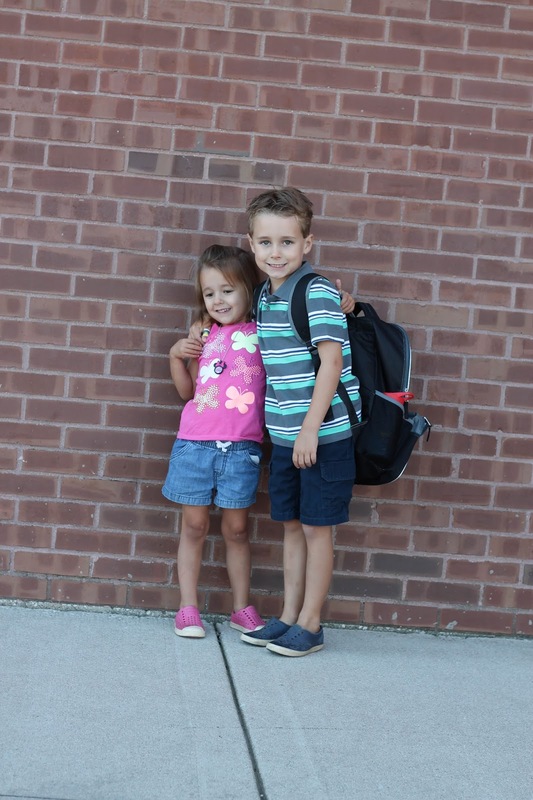 Yay for first grade though! I love the t-shirt idea. I need to remember this when Brantley starts kindergarten. 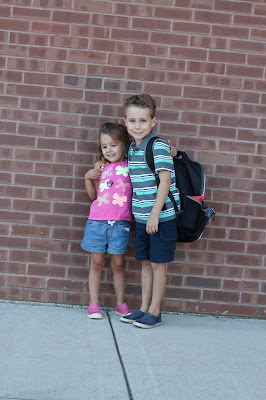 And I love all of the first day photos! He is such a handsome little boy!